The Niagara SkyWheel is Canada’s Largest Observation Wheel. Niagara SkyWheel goes up to 175 feet above Niagara Falls and allows us to see and enjoy a spectacular view of the Horseshoe and American Falls, the Niagara River Niagara Parks and other landmarks. The 42 fully enclosed gondolas are equipped with heating and air conditioning for year-round comfort and enjoyment, day and night. The ride duration varies from 8 to 12 minutes with spectacular aerial views for miles in every direction. Evening rides offer dazzling views of the glittering lights of Clifton Hill and the surrounding Niagara skyline. This is an exciting way to see Niagara Falls for everyone in the family. My son is a dinosaur fan so he was excited when we chose to go to Dinosaur Adventure Golf. With the Clifton Hill pass we can either go into Wizards Golf or Dinosaur Adventure Golf. Being surrounded by gigantic pre-historic dinosaurs and lush vegetation we enjoyed playing miniature golf and taking pictures. Dinosaur Adventure Golf has two 18-hole courses: "Raptor" and "T-Rex" which is a Total of 36 Holes making it one of the largest miniature golf courses. There are 3 distinct decorative ponds with fast-moving rapids and bubblers; and a 50 foot high “active” steam-erupting volcano that lets golfers play directly through a realistically eerie, cavernous volcanic interior on their way to the 18th hole. The miniature golf course is spread over 70,000 square foot playing surface, and populated by 50 realistic and life-sized, dinosaurs many of the dinosaurs are over 30 feet high. A digital sound system compliments the scene by pumping out jungle and nature sound effects. A walk through Movieland is a like a walk through entertainment history. Movieland wax museum has movie, television and music celebrities such as Johnny Depp as Captain Jack Sparrow, Harrison Ford as Indiana Jones and Tom Hanks as Forest Gump, as well as Justin Bieber, Hannah Montana, Harry Potter and more. Music and recording stars include Elvis Presley, Hannah Montana, Shania Twain, and more. For those brave enough, you can visit the optional “House of Horrors” at the end of the Museum tour. At the exit of Movieland there is a Fun Factory gift shop to get souvenirs. The Great Canadian Midway entertainment complex has 70,000 square feet featuring over 300 games. The vibrant colours, stimulating sounds, interactive rides and games are for people of all ages. There are games like Skee-Ball, Roll-a-Ball, like Super 21 and Deal or No Deal and more. We get 5 Great Canadian Midway Tokens with the Fun Pass and can purchase more if needed. The all-new XD Theater 6D motion ride takes visitors on an amazing adventure that transcends time, space and imagination. The modern special FX technology includes the fully immersive stereoscopic imaging, realistic motion with up to 2 G's of acceleration, special seats that bear 400 movements per second, plus intense wind effects and dazzling light effects. We can enjoy the XD Theater's broad range of motion, which goes from gentle murmurs to intense trembles, making the ride seem real. Ghost Blasters Dark ride located inside the Great Canadian Midway is a haunted house themed dark ride with cool interactive “black-light” adventure, different animatronic characters, animated props, and set pieces, giving it a whimsical spookiness. We can use the laser gun to blast and get the highest score by blasting away ghosts with the most accuracy. Each car holds two people, so you can enjoy the ride with a friend or parent; or you can ride alone as long as you are at least 42" tall. 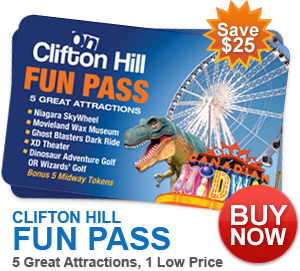 If you like to win Clifton Hill Fun Passes for a family of four value over $100 (Each pass is $25.95+ tax) then enter the giveaway through the rafflecopter below before July 10th. This giveaway is open to everyone in US and Canada who can go to Niagara Falls. Please follow my social media networks and leave comments to be eligible to win. I live in US and would love to win this ticket .Never been to niagara ,so looking forward finger crossed . I live in Ontario, Canada. We haven't been to any of these attractions however we generally visit Niagara 2x per year. Never been to these attractions even though we've been to Niagara Falls about 4 times. I live in Canada. I am from Canada and only saw the Falls and Marineland! We take our children to Niagara Falls about 3 times a year and have never really experienced Clifton Hill to the fullest! This would be awesome. Canada, about an hour and a half from Niagara. We love all of these attractions but especially the Skywheel! Give giveaway I would love to win! We live in Ontario and haven't done any of these attractions. Niagara sky wheel is just amazing. Horseshoe falls is a beautiful falls. Reviews about Clifton hills is just amazing. That ferris wheel sure is big! But looks like a wonderful time! I'm from the US--we make it to Niagara Falls 2 or 3 times a year. I've been on the Skywheel, played Dinosaur Golf, and visited the Wax Museum. I LOVED the Skywheel and the Dino Golf, hard to choose a favorite!! Great review, BTW. I live in Ontario and I have never been to those before. I live in Ontario. I haven't been to these attractions before but would absolutely love to. I live in Ontario and have been to the Dinosaur Adventure Golf. There's so much to do in Niagara Falls - Canada and would love to take the kids again! Have also been to the The Niagara SkyWheel and that is my favorite! I am from Ontario and I have never been to any of the these attractions before. I live in the GTA area in ON, and I have been to the wax museum! Would love a weekend away!!! Ontario! We've ridden the skywheel and loved it! I live in Ontario, Canada. 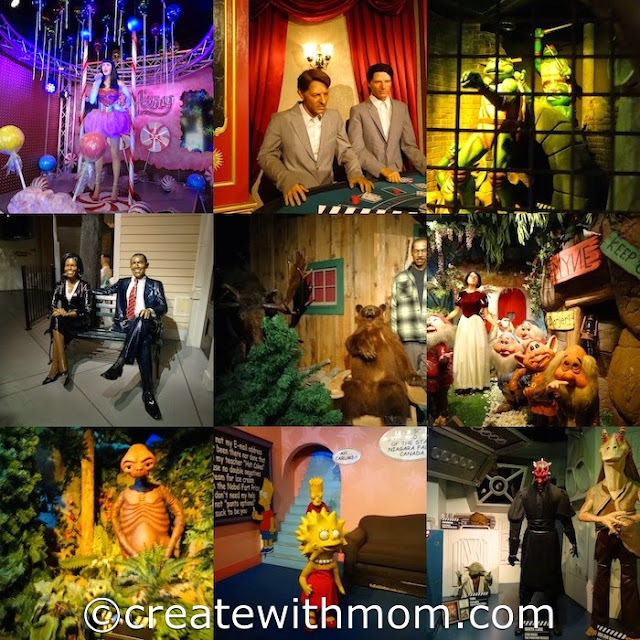 I have been to the wax museum before and loved it! I live in Toronto and I love the ferris wheel. I live in Ontario and I have never been to the attractions because I just walk around the area usually. I live in Canada, I would like to go on the skywheel! I live in Ontario. We've been to the wax museum. I would love to take my son to the Dinosaur Golf! I live in Canada and no we have never been to any of these attractions before. I'm from Toronto and I would LOVE to win this! I would love to go with my hubby and two daughters! THey have never been! Hubby and I have when we were dating and I would love to go again and show my girls! How fun! I'm from Ontario and nope, I've never been to any of these attractions before. We just visit the falls and return home. I would love to take a look around Clifton Hill some day, it looks fab! I live in Ontario. No, I have not been to this attraction. I live in Ontario, and while I visit Niagara Falls often, I've never been to any of these attractions. My son really wants to go on the Skywheel though. I live in canada and ive been on the Ferris wheel. It's deffinitely my favourite. We live in Canada! Haven't been to these attractions in years....But we've recently moved 15 minutes away from the falls, definitely want to spend the day on Clifton Hill. 4 of us planning to celebrate my little girl's bday at Niagara , would love to see this that time. I live in Ontario and I haven't ever been to or seen any of these attractions. We live in Canada, but I have never checked out the sites in Clifton hill. I'm from Ontario. I go to Niagara Falls annually but yet to get on that Ferris wheel.